New recipes can provide some much needed variety to a menu that’s getting old. On average, families rotate between 10-12 recipes, and that’s being generous. We’re creatures of habit. And there’s good reason for that. New recipes, as exciting as they are, require a lot more thought. First, to find the recipe. Then, to ponder the ingredients (ex. Do I have those? Do I know what that is?). And then finally, the preparation. Since it’s new, it’s not second nature (ie. Harder to manage the kids AND cook). A common mistake that I see being made is trying too much, too fast. Whether it’s a new weight-loss plan, or just trying to improve your nutrition, I see women getting overwhelmed and consumed by food. And then when life happens (‘cause it always does) they end up feeling like a failure. My recommendation is that you don’t try more than one new recipe per week. That way you can try out new things, find some new recipes for your rotation, without going crazy. Now, where do you find said recipe? Well, I like choose from Chef’s and here’s why. They care a lot about the quality and freshness of the ingredients. Chef’s like to use what’s local and in season wherever possible. 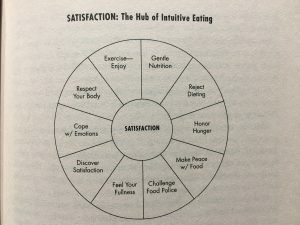 A Chef is “satisfaction driven” vs “nutrition driven”. Their primary goal is to create a satisfying and tasty meal. It’s about the flavours and textures. There’s a love present that I just don’t see with most “nutrition driven” cooks. Am I saying that nutrition is unimportant? Heck no. But what’s the point in a nutritious meal that nobody will eat? Have you ever done that? I sure have. I remember when I stopped using sugar. I had muffins, bean salads, and granola that nobody would eat. And when I got honest, I didn’t like them either. So now, I use the least amount of sugar that I can while still making it satisfying and enjoyable. There are too many to list for sure. The point is, find someone who LOVES food and let yourself be inspired. Let’s be honest, the nutrition gurus can’t seem to make up their minds about what’s healthy and what’s not. And everybody seems to have ‘evidence’ to back up their claims. Try not to get caught up in the hype. Start to cook a little bit from home using fresh ingredients where possible. If it came from the ground or a tree or a vine then I say it’s fair game. Where do you find food inspiration? P.S. Have you watched The Diet Escape Plan yet?